Oh, what a complete and total joy this was to stitch! I learned so much and felt like such a freakin' rock star the entire time it was in my hands that I didn't want to put it down. Don't you love it when a designer makes you feel like you actually might someday have half a clue of what you're doing? Who's better than Ms. P for that, I ask you? And can I give a big shout out to Miss Charlene, Her Also Very Fabulous Self for a wonderful tip about bullion knots....(use a Milners' needle so that the entire length of the needle is the same circumference and the little knots slip off easier....who knew? and Miss Elizabeth of Needlepoint Now fame, Her Also Very Fabulous Self Too for a great how-to video on the YouTube that made learning how to actually do the damn little bullion knots very very simple. One of my very favorite movies of all time is "Moonstruck". 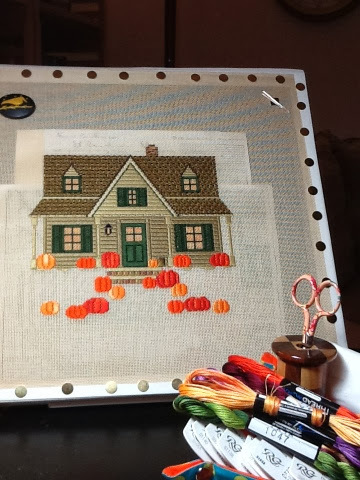 So last night, as I settled my big fat heiney into the Happy Chair apres' dinner (leftover lasagna and a salad, thankyouverymuch), I stitched the moon on Laura J. Perin's Harvest Moon House while belting out the theme song. Laura says to randomize your tent/basketweave stitches so that you get a good effect with the colors in said moon, and methinks she is a gee-ney-ous, since that's exactly what happened. Almost looks kinda real, if you ask me. As for the smoke...I'd love to tell you that I came up with those gentle wispy swirls on my own, but they are the result of me following the chart. Today I'll add the leaves to the trees and then the stems to the pumpkins. I've left those for last, since they are to be stitched in bullion knots, and I've never even tried one of those. I suspect that there might be a fair amount of cussin' in my future, but I am optimistic that I'll eventually prevail! Stay tuned! I've got an eighteen pound lasagne in the oven bubbling away, the windows and doors are thrown open to the cool and lovely breeze, Stewey is sacked out in the patch of sunshine coming in the back window, and I'm headed to the Happy Chair for some Sunday Stitching! Here's hoping that your neck of the woods is perfectly perfect in every way today! Woo Hoo! Look! A flagstone walkway! Some lovely bushes! Now you can make your way to the front door so that Stewey and I can welcome you in for a cup of tea and some wonderful little biscuits! Woo Hoo! On Friday afternoon, I wrote a list of about 30 things I wanted to accomplish. "It's a nice long weekend"' I said to no one in particular. "I think I'll take advantage of it and get some stuff done." Friday evening: Zip. Zilch. Nada. I did manage, however, to drool all over the Happy Chair when I fell asleep in it at 7:30. Saturday: Aunt Chrissy and I went to House of Stitches and then It was again with the zip...zilch...nada. This time I was drooling all over the Happy Chair by 7:15. Today: Labor Day. I called Aunt Chrissy at noon and said "I think I'm going to go for a quadra fecta and not do a thing today." She replied with a "What the heck is a quadra fecta?" and wished me good luck. I'm not sure exactly what happened, but at about 1:00 I suddenly found myself outside cleaning up the gardens, and then it was inside to clean the bathroom, do the laundry, grill the chicken, water the plants, sort the fridge, organize a fall stitchy basket, balance the checkbook, change the bed, wash the dog....it's 8:15 and I'm ready to drop. Here's my progress on Laura J. Perin's "Harvest Moon House"